Sometimes Beas or SBO may be blocked (Program crash, or hang up. If Beas is ended, SBO keeps running. Reason may be a deadlock on the SQL-Server. 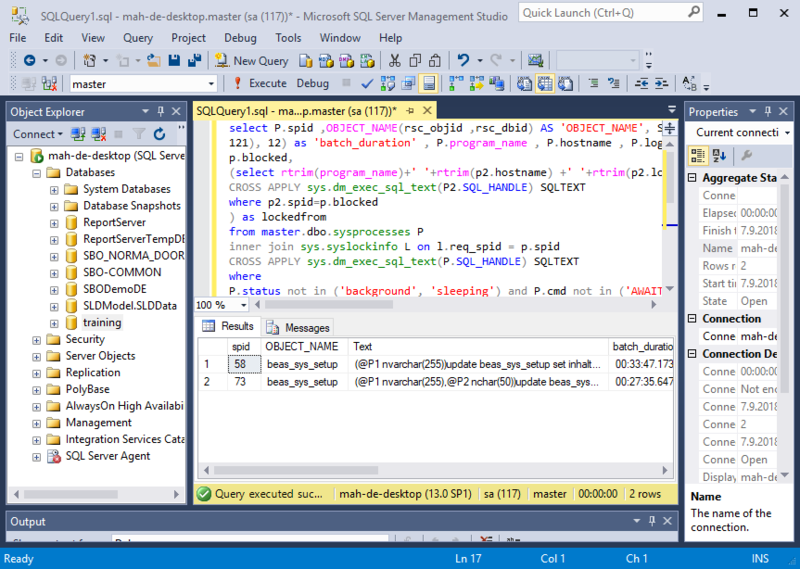 Before searching for the error, restart the SQL-Server. Especially after updating SBO a restart of the SQL-Servers is recommended, to release memory. If Beas cannot be started at all, on the SQL-server using a SQL-command you can determine, which station is causing the deadlock. 2. start Beas -> Beas can't start, it's freezed. For each blockage information needs to be determined new. Only this way you an find out if it is a hardware or a software problem and what to do. What could be possible reasons? There may be various reasons. It is often not that easy to find the reason, the support can only help, if the client analyzed the problem in detail before. 80% of all cases were related to hardware problems. Always the same station is the originator although the same operations are performed on other stations. The error causing SQL-statements are different. Then, the actual reason is the work station itself, the connected network cable or the hub. Various work stations are originators but the blocking SQL-statement is always the same. In this case, one can assume that a software error is the cause. Ends the connection for Spid 30. There is no need to restart the SQL-Server. Beas and SBO re-establish the connection immediately. It may be, that on the affected work Station SBO or Beas needs to be restarted. closes connection for Spid 52. Now, the SQL-Server does not need to be re-started after a malfunction. Beas usually re-establishes the connection after issuing an error message. SAP - Administration - System Initialization - General Settings - Services - "Inbox for new messages" please disable for each user. If necessary it can be activated again.